Sunshine Kelly | Beauty . Fashion . Lifestyle . Travel . Fitness: Fjallraven SEA Bootcamp 2017: How Bootcamp Works & What to Expect? Fjallraven SEA Bootcamp 2017 is making a glorious return in 2017 with 4 new installments spread out across the year. This is to emulate the Classic series, to help and inspire more people to get outdoor and reconnect with nature. This Bootcamp also introduce to more people the Fjällräven way of trekking: with everything you need, in good company, and respecting nature. 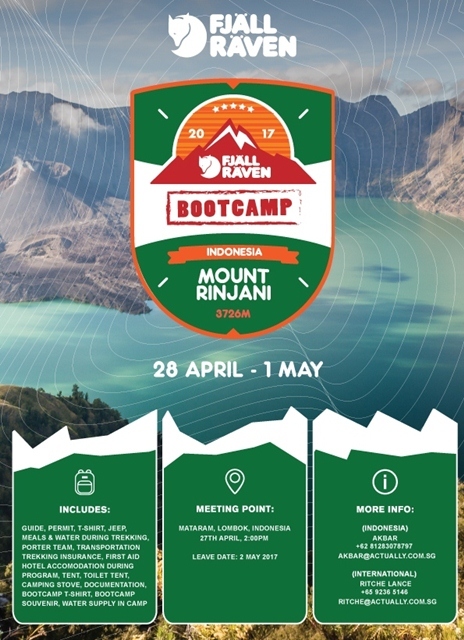 Fjallraven SEA Bootcamp series in 2017 kick off with the beautiful Mount Rinjani on the 28th of April. Mount Rinjani, the second highest volcano in Indonesia stands at a mighty 3,726MASL. Situated in West Nusa Tenggara, Lombok Island, the Rinjani trail brings you through the beautiful tropics of Indonesia, to a magni‑cent view of a lake at approximately 2,000MASL. Which also include a hot spring, and ends with a picture perfect scenic view at the peak. Participants will gather at Mataram, Lombok, Indonesia, on the 27th of April and will then slowly make their way to base-camp, before setting off on the trek on the morning of the 28th of April. Transport will be provided from Mataram, Lombok. Be prepared to be amazed by the beautiful natural landscapes of Mount Rinjani. Alongside new friends and fellow nature enthusiasts, trek along the trails and even stop for some fresh fruits along the way at various rest stops. Lay your back on the green pastures of grass and gaze at the beautiful night sky, or have some warm coffee or tea at campsite. Share your stories alongside others, as there will be a sharing session at camp, with a number of speakers sharing on various different topics. While the magnificent views at Rinjani continues to wow you and remind you of how beautiful nature can be, join us in cleaning up and keeping the nature ever clean and beautiful as we will be distributing Fjällräven Trash Bags to participants, as well as other campers at Rinjani, to educate on the importance of leaving no trace behind. I've never heard of Mount Rinjani as I have not been to Indonesia yet..but seriously, the view is so spectacular! Oh, okay, its actually not that expensive. I wish I have time to go to one of those location.